Secretary of Defense Jim Mattis, left, and U.K. Secretary of State for Defense Gavin Williamson stand for the National Anthem during an arrival ceremony prior to their meeting at the Pentagon, Aug. 7, 2018. 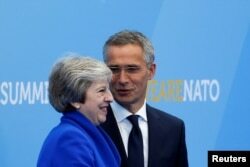 FILE - Britain's Prime Minister Theresa May is welcomed by NATO Secretary-General Jens Stoltenberg at the start of a NATO summit at the Alliance’s headquarters in Brussels, Belgium, July 11, 2018. FILE - A model of a new British fighter jet, called Tempest, is unveiled at the Farnborough Airshow, in Farnborough, Britain, July 16, 2018. This story originated in VOA's Serbian service. Some information is from Reuters.